In a World Cup where the quality of referring has generally been very good, it was somewhat disappointing to see a referee being conned as much as he was last night. With FIFA intending to crack down on cheating, hopefully Kader Keita will face a ban for going down like he a received a right hook from Ricky Hatton, after running into the side of Kaka. The last ten minutes of the Brazil versus Ivory Coast took the gloss off an enjoyable game and good performance from the Brazilians. 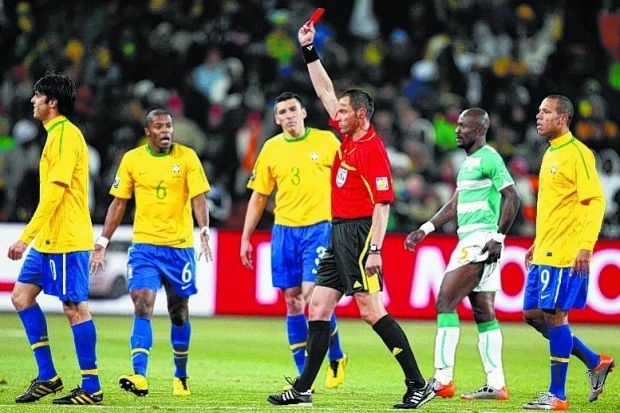 Perhaps Brazil were instigators of the farce that the closing moments of the game turned into. Intent on wasting time, Brazil seemed to go down injured every time they were tackled. Ivory Coast seemed to have enough of this, and began giving their opponents something to complain about. With tackles flying in, and the odd push and shove going unpunished, it was perhaps clear that someone would see red sooner or later. On the whole though, it was a comfortable 3-1 win for Brazil and despite the double handball for Luis Fabiano’s second goal, the performance will have sent out a message to the other sides at this World Cup: that they mean business. With one of the pre-tournament favourites putting in a good showing, Italy will be really disappointed with another unconvincing display, this time being held to 1-1 draw by New Zealand. The result is being reported as the biggest win in football history for New Zealand, and it was a good defensive performance from the Kiwis, especially the solid Ryan Nelson at centre back. After surprisingly going ahead in the early stages, the onus was on Italy to get back into the game. A clumsy challenge in the penalty area from Tommy Smith sent Daniele De Rossi tumbling, something that De Rossi isn’t shy of. Saying that, it was probably the right decision, and Iaquinta made no mistake by converting the penalty comprehensively. The defending champions piled on the pressure towards the end, but could not find a way through, and were lucky that New Zealand missed a chance from a good counter attack. With England, France and Spain struggling in their matches so far, maybe Italy could be on the receiving end of a shock exit after the group stages. Earlier in the same group, Paraguay beat Slovakia 2-0 with a stylish display, to put them on the brink of progressing. A goal in each half was enough to seal the three points and top the group. With Slovakia now to face Italy in the final group game, it could either be the end of the Slovakians, or yet another shock result involving the defending champions. Off the field, the French camp was determined to take the focus off their on field performances, by providing another ridiculous spectacle of themselves, refusing to train after striker Nicolas Anelka was sent home for verbally abusing their manager. Surely this can’t be good for the French. With just days to go before their do or die match against the hosts, they now face elimination at the group stages for the second World Cup in 12 years.